Yesterday I spent the day with my husband, crossing something off our Couple’s Bucket List – travelling on the beautiful Carlisle to Settle railway. It was a lovely day and we both thoroughly enjoyed it. I had little contact with social media and so it wasn’t until we got home that I saw that it had also been a momentous day for about 40,000 runners as they took part in the Great North Run. 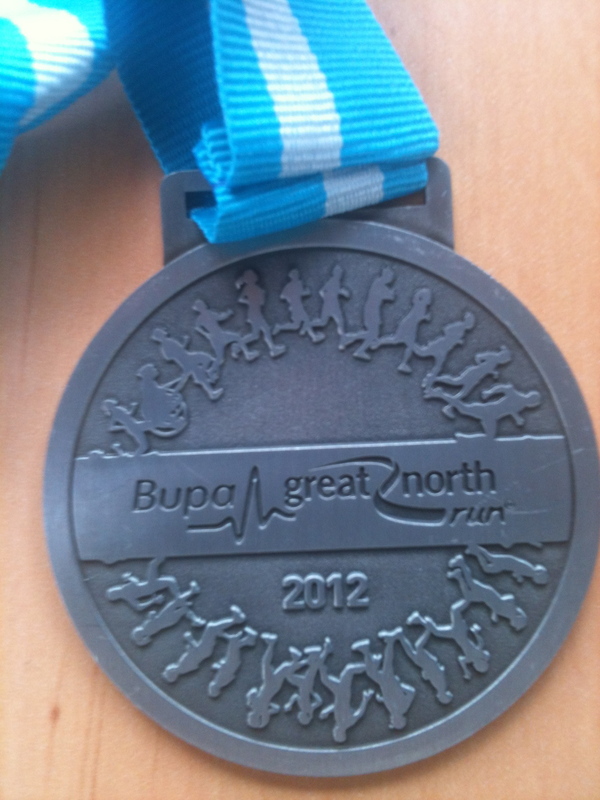 I’d vowed, after the first one I did, not to do the GNR again. I loved the race and did my best half marathon time so far doing it, but I hated the crowds and the getting there and the getting home. And the cost! But yesterday, after seeing all those smiling folk clutching medals, my mind went straight back to 2012. It was my first half marathon race ever and I felt totally out of my depth. I was so nervous! This morning I decided to pay homage and wear my 2012 T-shirt, but I soon realised that since not being able to run lately my T-shirt is slightly too snug for comfort. On the hip front, well I’m not further forward. I’m still taking my pills and I’m still able to walk further than I was in mid-August. I’ve even started cycling, albeit on a stationary bike, and can manage 10k at a time with no apparent adverse effects. When I started my left leg appeared much weaker than my right, so I’m gradually building that strength back up. I finish each session with 5-10 minutes of yoga stretches. I’m not cured. There are times when I walk too far and my hip screams its disapproval at me, bringing me to a painful full stop. I haven’t heard from the doctor or the hospital. Getting a doctor’s appointment is really difficult and even phone appointments have to be booked a week ahead. So I haven’t tried. I know I should and I know I should be pushing this forward, but I’m getting tired of being poked and prodded and hummed and aahhhed over. I just want a nice, quick fix so I can get back to where I was, a runner running half marathons. In the meantime I guess I’ll stick to my bike in the shed. And be grateful that I can, at least, cycle on the spot.